Acknowledged author Michael D. Johnson wrote Human Biology: Concepts and Current Issues Plus Masteringbiology with Etext - Access Card Package comprising 9998 pages back in 2016. Textbook and etextbook are published under ISBN 0134042239 and 9780134042237. 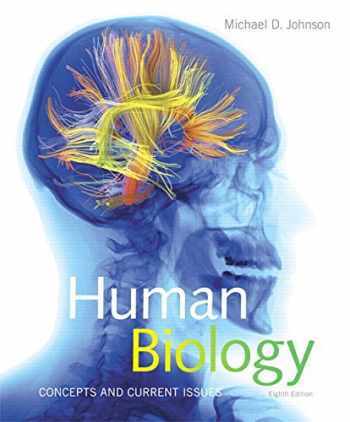 Since then Human Biology: Concepts and Current Issues Plus Masteringbiology with Etext - Access Card Package textbook received total rating of 4 stars and was available to sell back to BooksRun online for the top buyback price of $33.05 or rent at the marketplace. NOTE: Before purchasing, check with your instructor to ensure you select the correct ISBN. Several versions of Pearson's MyLab & Mastering products exist for each title, and registrations are not transferable. To register for and use Pearson's MyLab & Mastering products, you may also need a Course ID, which your instructor will provide. Used books, rentals, and purchases made outside of Pearson If purchasing or renting from companies other than Pearson, the access codes for Pearson's MyLab & Mastering products may not be included, may be incorrect, or may be previously redeemed. Check with the seller before completing your purchase. For courses in human biology. This package includes Mastering Biology. Explore Human Biology in Relation to Current Issues, in the Text and Online Through his teaching, his textbook, and his online blog, award-winning teacher Michael D. Johnson sparks interest in human biology by connecting basic biology to real-world issues that are relevant to readers’ lives. Using a storytelling approach and extensive online support, Human Biology: Concepts and Current Issues, 8th Edition not only demystifies how the human body works but also drives readers to become a better, more discerning consumer of health and science information. Each chapter opens with Johnson’s popular “Current Issues” essays, and within each chapter, “BlogInFocus” references direct readers to his frequently-updated blog for breaking human biology-related news. Personalize learning with Mastering Biology Mastering™ Biology is an online homework, tutorial, and assessment product proven to improve results by helping readers quickly master concepts. Readers benefit from opportunities to practice basic science literacy skills, using interactive resources that create engaging learning experiences. Effective activities in Mastering Biology help readers further visualize and understand complex biological processes. 0134042239 / 9780134042237 Human Biology: Concepts and Current Issues Plus Mastering Biology with eText -- Access Card Package Package consists of: 0134254902 / 9780134254906 Mastering Biology with Pearson eText -- ValuePack Access Card -- for Human Biology: Concepts and Current Issues 0134042433 / 9780134042435 Human Biology: Concepts and Current Issues Human Biology: Concepts and Current Issues, 8th Edition is also available via Pearson eText, a simple-to-use, mobile, personalized reading experience that lets instructors connect with and motivate students – right in their eTextbook. Learn more.